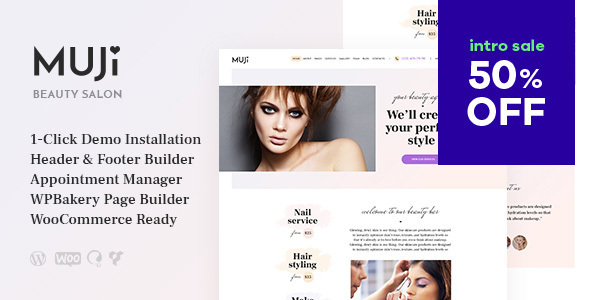 Muji is a responsive, contemporary & alluring WordPress theme with a fresh, clean and modern design. With all the theme features, you can easily start or promote any Wellness services company, Yoga, Spa agency, Beauty firm, Hair Salon organization or Massage Room Business bureau. Muji comes with awesome built-in plug-ins, such as Revolution Slider, Booked, Essential Grid, WPBakery Page Builder for creating any layout at your taste. The theme is fully responsive and 100% Retina-ready. Muji best suits for Spa, beauty, massage, health care shop, makeup store, massage, nail, physiotherapy, skincare, hair, wellness or yoga blog websites.